I thought it was funny. Harsh, but funny. LOOOOOOOOOOOOOOOOOL, I love it. Nice find! Yeah, I couldnt help giggling at it either, even though it is pretty sad that is the mentality of a lot of Muslim Communities. Women are to be seen COVERED and not heard. 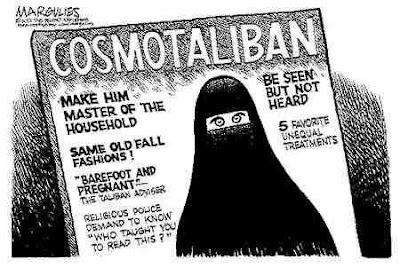 i'm really sad for having seen this comic... as if the niqaab makes someone dumb!! i wear it and i'm not dumb at all, alhamdulilah. actually, i know many other sisters that are taking courses on university at the highest levels like magistrates, mashaAllah. also, not being heard is in case of non-mahram presence, if we are chatting aloud with our sisters, it would be rude and a cause of fitnah to the men around. we always should talk in a professional manner when dealing with non-mahram not to let shaytan come in the way.